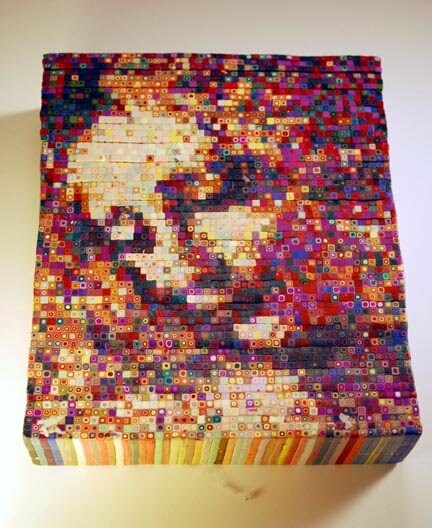 Julie Eakes is pushing the boundaries of extrusion-based mosaics again. This time she used a looser palette and a more stylized image as her starting point. Would the image still be discernable? This is the small version of the finished cane. I’m partial to the dimensional original cane. Mixing the palette for one of these works is an arduous dance between Photoshop and the pasta machine. 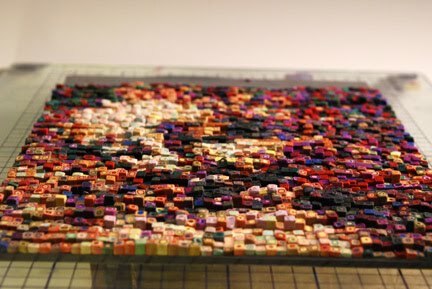 She created 2,000 color samples on the computer to arrive at her last palette. No small feat! Read her story here. The cable guy appeared and we’re back in business. Heaven! Brava Julie!! Her canes are simply amazing… if you ever get a chance to see her cane work in person, grab it. I acquired one of her necklaces (inspired by her trip to Africa), and have it hanging in my studio to inspire my muse and stretch my brain. As you can see I finally finished my second mosaic cane. I remember when I finished the first that I really liked the “dimensional” ends of the cane. Unfortunately taking a slice of the cane proved to be a giant obstacle. This time as I finished a row I trimmed and added it to a sheet of raw clay. I have only two of those. I will bake them and show them to you when I get a chance. Maybe next time I’ll bypass the cane completely and just make boards. (Maybe I should say canvas?) Thanks for the post. This beautiful mosaic is indeed stylized. That’s what makes it art that goes beyond craft. Two possible things you can do while trying to see the image at its earliest stage is: 1) look at it through the wrong end of a handheld telescope or the wrong end of one lens of binoculars. The other thing is to photograph it, bring it up on your computer and then reduce the picture until you have a good idea of what the finished product will look like. Keep up the great work! Julie, this cane is truly fabulous!! I am very detail oriented …. but this is nuts!!! I am soooo impressed and I love the image. Keep it coming girlfriend!! Incredible mosaics picture and a lot of hours to see the talent she has. Cinderella cane is amazing work the colors her poise is incredible.